This is a question we frequently encounter on our forum, and with good reason: one of the most important things you can do in law school admissions is be organized and plan ahead. If you signed up for a prep course that does not begin for another few weeks (or months), you are probably wondering if there is anything you can do in the meantime. Of course there is. But, before we tell you to spend another couple hundred bucks on study aids, let’s make things clear: our LSAT courses—whether the Full-Length, Live Online, or Weekend—are designed for students who have no prior experience with the test. Many of our students do, of course, but your instructor will not expect you to know what the contrapositive is. In fact, we don’t even expect you to know how to read. (OK, we sort of do, barely). Keep in mind, also, that we make a tremendous amount of LSAT prep material available to our course students, from lessons and homework, to additional practice tests, and even course supplements and additional lectures. Since you will probably not get through all of the material in the Homework for each lesson, let alone the extra practice tests and supplemental resources, you do not need to invest in “additional” materials to help with your studies. With all that said, studying on your own before classes begin—if done right—can help quite a bit. You will pick up the material faster. Your homework will probably not take as long, because you’ll be familiar with at least some of the conceptual material covered in it. You will feel more confident in class. And you will probably start taking practice tests earlier than your classmates, giving you more time to figure out where your weaknesses lie. Plus, you cannot predict how quickly your score will improve, so the earlier you start preparing, the better prepared—and more relaxed—you will feel in the end. So, how do you study on your own the right way? First, it is absolutely imperative to avoid learning poor techniques or inefficient approaches, which you will most likely need to unlearn once classes begin. Needless to say, this can do more harm than good. It’s an avoidable mistake provided you stay within the PowerScore’s LSAT “ecosystem”: The Logic Games Bible, The Logical Reasoning Bible, The Reading Comprehension Bible, as well as the corresponding workbooks. These materials present the same approach to the test and its various sections as your course books, so there will be no conflict between what you learn on your own and what you will learn in class. In fact, the Bibles provide an in-depth look at our methodology, and are particularly helpful as a starting point. By their very nature, the Bibles are pedagogically “static”: you can read about our approach to, say, Assumption questions and understand the Assumption Negation Technique, but you cannot interact with the material in the same way you can in class. This is why studying on your own will not render your classroom experience monotonous or useless: on the contrary, students who are familiar with our techniques tend to stay more engaged in class, and benefit even more from reinforcing the knowledge they already have. Although there is indeed some overlap between the Bibles and the course materials, this is primarily due to the fact that we try to keep our approach consistent. Rest assured, however, that your course books will have significantly more problem sets than any of our publications, and each of the thousand or so problems in your homework will be explained on-line in our Student Center. Start by reading the LSAT Bible that covers the section that concerns you most. You should always begin by attacking any perceived weakness that you have. For example, if you are concerned about Logic Games, begin by reading the LSAT Logic Games Bible. If another section troubles you, start with that LSAT Bible first. The best approach is to use the LSAT Bibles simultaneously. While the Bibles can be read in serial fashion, where a student reads one Bible completely before moving on to the next Bible, that is probably not the best approach for most students. A better approach is to read sections of each Bible at a time. For example, a student might start by reading the first six chapters of the Logical Reasoning Bible, then read the first three Chapters of the Logic Games Bible, and then read the first three chapters of the Reading Comprehension Bible, and then return to the Logical Reasoning Bible to complete another section of several chapters. This approach helps break up the tedium that sometimes accompanies studying for the LSAT, and it allows you to take entire practice tests on a regular basis so that you can track your progress in all three section types. Approaching the books in this fashion also gives you the opportunity to catch any area of weakness early on (and if you do find such an area, you can then focus more on the Bible that address that section). While there is no one “right” way to use the LSAT Bibles, the points above may help you shape your study plan. Just remember that each book is designed to cover its topic in totality, and so regardless of how you use the books you should derive great benefits by completing each. 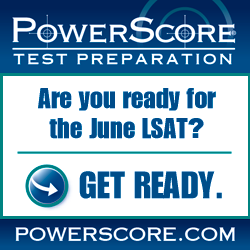 Should you do this before your LSAT prep course begins? Certainly part of the answer lies with your specific wants (desired score increase) and needs (strengths/weaknesses and overall starting point), as well as things like time constraints, financial considerations, etc. That said, there is every reason to start prepping as early as possible, and very few reasons not to. Photo: “My Roommate Studying” courtesy of Al Muya.